Oscar-nominated film Timbuktu and its treatment of terrorism. The Oscar-nominated Timbuktu quietly changes the way movies treat dangerous extremism. 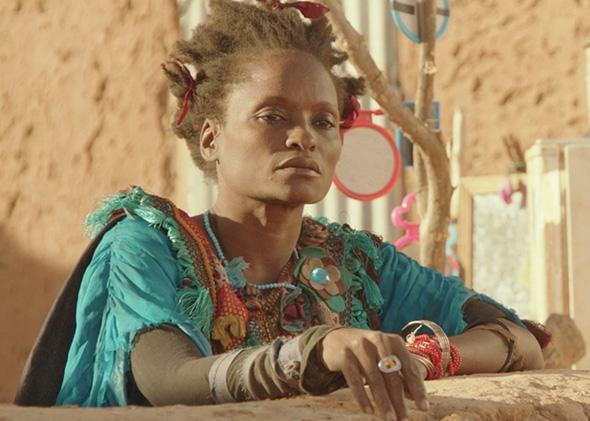 Kettly Noël in Abderrahmane Sissako’s Timbuktu. Movies about terrorism, whether told from the perspective of investigators, victims, or perpetrators, tend to focus on catastrophic attacks. This makes sense for cinematic reasons—few things build tension as effectively as a ticking bomb—but it also conforms with how we typically view terrorist groups. Terrorists disrupt our lives with shocking acts of violence. They plant bombs, take hostages, and bring down planes. But the best known terrorist groups in the world today—al-Qaida and its offshoots, ISIS, Boko Haram, al-Shabab—are only “part-time terrorists,” as focused on expanding and ruling their territories as they are in the type of activity we normally define as terrorism. The vast majority of these groups’ victims aren’t killed in spectacular attacks like 9/11 or the Charlie Hebdo shooting; they’re locals caught up in civil wars in places like Syria, Yemen, and northern Nigeria. Boko Haram now controls an area the size of Belgium in Nigeria. The territory under ISIS’s control is the size of Britain. But few images from inside these pseudostates reach the outside world, other than the grisly videos and propaganda that these groups produce themselves. For that reason, Abderrahmane Sissako’s Timbuktu, a nominee for the Best Foreign Language Film Oscar, feels particularly welcome. It’s not only a visually gorgeous and emotionally affecting movie; it also shows a side of modern warfare that as far as I know has never before been depicted on film. Set near the Malian city of its title but filmed mostly in Mauritania for safety reasons (it’s Mauritania’s first ever Oscar nominee), Timbuktu is based on events that took place in 2012, when jihadi fighters, including some linked to al-Qaida, took over a wide swath of northern Mali, imposing their harsh interpretation of Islamic law. The militants were eventually pushed back with the help of a French military intervention in early 2013. It’s not clear when “those people” arrived, but their presence is unavoidable. They strut about town with megaphones, announcing new daily edicts against women wearing uncovered hair or men wearing socks. The Kalashnikov-bearing fighters are hypocrites: They sneak forbidden cigarettes when no one is looking, they awkwardly attempt to flirt with the same women they bully into covering their heads, and they debate the merits of Zinedine Zidane and Lionel Messi before sentencing others to public floggings for playing soccer. They’re also not particularly bright. They refer to themselves as God’s representatives on Earth, but when the irate local imam challenges their understanding of the Quran, it’s obvious from their blank expressions that they haven’t really thought about it too much. The real-life occupation of Timbuktu was a cultural tragedy as well as a human one. The rebels wantonly destroyed the famed mausoleums and medieval manuscripts in the city, a center of trade and learning since the 13th century. Sissako is particularly sensitive to this, opening the film with a scene of the fighters firing their guns at un-Islamic statues, a sight all the more depressing for the inefficiency of the method. Mali’s famous guitar music, banned by the occupiers, also plays a key role in the plot—and, played on the film’s soundtrack, it helps establish a clear and beautiful sense of the culture that’s lost under Sharia. Sissako, director of Bamako and Life on Earth, plays with the audience’s assumptions about jihadi fighters. A young fighter is shown filming a video in front of an al-Qaida flag in a scene that has all the aesthetic markers of a suicide bomber’s final pronouncement, but instead delivers a halting (and not particularly convincing) testimonial renouncing his love of rap music. The characters in Timbuktu don’t fight back against their occupation, but the film does make a point of displaying more ad hoc forms of resistance. A sassy fishmonger unloads on a young fighter pointing a gun at her when he tells her she has to wear gloves in addition to a hijab. An old woman in rags tells the men that they are “assholes” and is given a pass either due to insanity or because they have to admit she has a point. In one of the most poignant scenes in any movie this year, a group of young men banned from playing sports pantomime a game of soccer without the ball. Timbuktu unfolds at the languorous pace of desert life, and for a film about wartime, there’s very little violence for much of it. Life under fundamentalist occupation is shown mostly as a long stretch of monotony interrupted by petty humiliations. But when the violence does inevitably come, it’s brutal, realistic, and unsentimentalized. Sissako was inspired to make the film by the story of the public stoning of an unmarried couple. But for all the fighters’ ignorance and brutality, Sissako is surprisingly sympathetic to them. In another key scene, the gunmen surround a house where a mixed-gender group of young people is defying the law by playing music. “They’re singing the praise of the Lord and his prophet,” protests one of them, but it’s unacceptable nonetheless. The camera holds on the young men as they linger outside the door just a little longer than necessary to listen. Enforcing an ideology with no room for kindness, relaxation, or culture, they crave a bit of humanity as well.